If you have brick staircases or porches inside and outside of your home that may be in need of a little touch up, you may want to learn how you can build brick steps. Some homeowners find that brick details increases property value in some cases and add an element of beauty that some other materials may not contribute to their overall landscaping. Bricking can enhance the current look and feel of your home. For this project, you don’t have to be an experienced Mason or construction handyman to complete this task. It’s a fairly easy task to complete for the do it yourself type of person. If you’re up for the task save yourself the money and give it a try. You just need the right materials and the will power to get the job done. Here is how you can make bricks step. Continue reading to find out how. 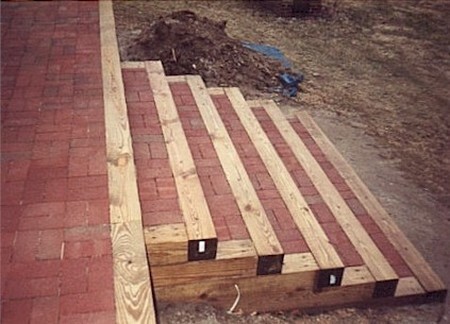 Construct the rectangular frame for the base of the brick steps with 2 x 4 beams. Make the frame the same width and length as your original staircase. Use them as a yardstick. Use a level to ensure that everything is built evenly. If the foundation is uneven then the entire project will end up uneven as well. Mix some cement for the concrete base. Follow the manufacturer instructions on the back of the cement packaging. After the concrete is mixed, pour it evenly inside the rectangular frame. Level the concrete mixture out with a trowel. Allow the mixture to harden and dry over a 24 hour period. Measure the distance between the top of the porch to the concrete base. This number represents the height of your stairs. Calculate the rise of each step. 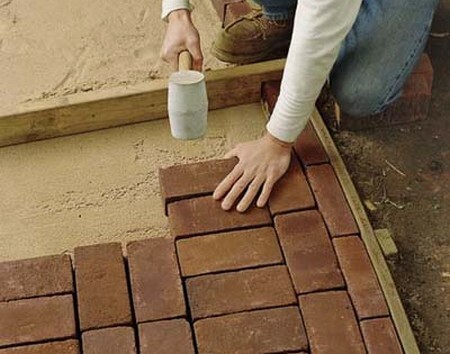 Do this by using the dimensions of the bricks you will use for the project. Now apply the mortar. Spread it evenly onto the concrete base. You don’t want it to be over 1 inch thick. Lay each brick on the mortar equally spaced and leaving ½ an inch between each brick. Use the trowel to fill in the extra spaces with mortar. Do this before trying to apply the next layer of bricking. After everything is in order, apply a final layer of mortar across the top of the bricks to continue the next level. Continue building in this way until your brick steps are completed to the specifications of your design. Enjoy your new brick stairs.